Fake fur coat with leopard print - Perfect for fall or winter weather time. Lightweight and fully lined, could even be used as a jacket. So soft and fuzzy and a fun item to wear. Vintage style with wide collar. 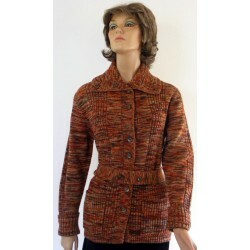 Has 2 hook front closure like genuine fur coats. Pockets on each side. This fake, leopard fur coat would be a nice one to add to your wardrobe! 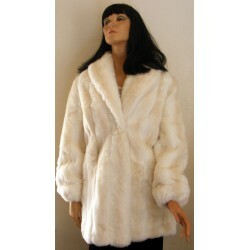 Genuine, women's fur coat for sale. Vintage, swing style with plenty of room and movement in the back. 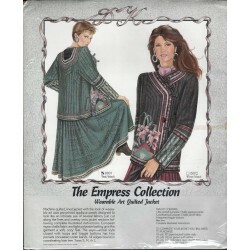 The sleeves of this coat have large, wide cuffs on them. One button and one hook closure in the front. Below the knee length. Soft, slightly reddish color fur which I believe is mink. 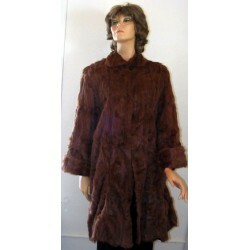 This vintage, fur coat is a perfect candidate for restyling or projects. Elegant and Classic! This emerald green velvet coat from the 50s has a lovely gold, satin lining which really pops with the color of the coat. 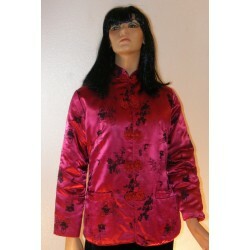 Each 3/4 length sleeve, has two rhinestone buttons so you can button it with a loose or snug fit. The buttons really sparkle against the dark green of the soft, velvet fabric. Beautiful and soft, this black jacket from the 80's is made of black velvet with soft pink flowers and green leaves.